Thanksgiving is never a huge affair for us, a fact that is sort of growing on me. Because both my boyfriend and I are pretty far from our respective families, we’re stuck with one another for t-day. In grad school, we did our share of friendsgivings, but in the past few years, we’ve developed our own little tradition of spending the day in and cooking together.Although I feel a little self-conscious about not having a crowd at the table that day, I’ve come to really look forward to a simple day in the kitchen. That said, I was stupid excited to be able to cook for my family last year at Christmas, even if (and maybe especially because) we had to sit in folding chairs in the living room because we couldn’t all fit at my kitchen table. I hope for another rag-tag meal like that with the folks I love again soon. Good food and no fuss above all. Until then, we’re keeping it uncomplicated for Thanksgiving again this year. We’re still thinking about what will be on the table that day (It’s soon! I know! 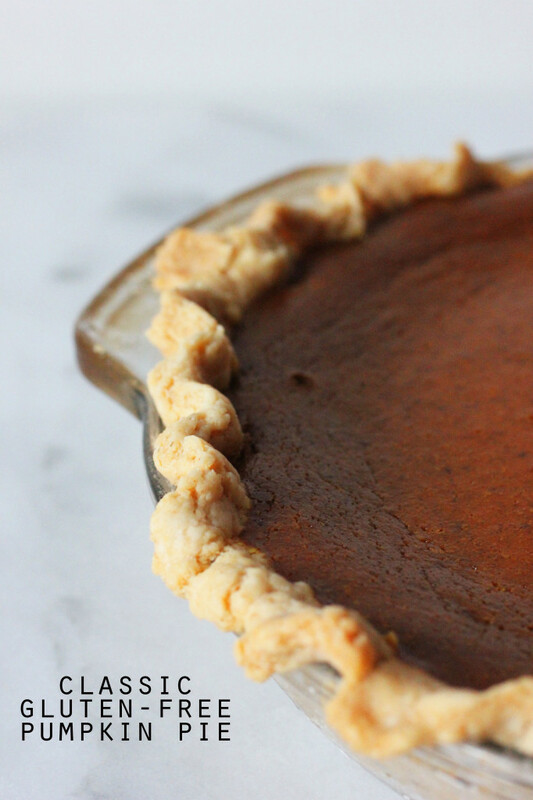 ), but this classic pumpkin pie made with heavy cream will definitely be there. Something I’ve been trying to keep in mind lately is “better, not more,” which, turns out, is a helpful intention for menu-planning and for life. Recently, the folks at MightyNest asked me to partner with them to highlight Duralex glassware and help inspire a switch from plastic to glass, which fits squarely in the “better not more” kitchenware camp. Duralex makes my most favorite little picardie tumbler. You’ve likely spied it here or in my instagram feed before. I love the classic design and the fact that they stack easily on my no-space home bar. Plus they’re tempered, so they’re durable even in the most clumsy hands (mine!). I test-drove these stackable Duralex glass bowls when I made this pie. The range of sizes in the set–from big ol’ mixing bowl to itty bitty pinch bowl–means I may finally be ready to part with a few members of the hodgepodge collection of plastic bowls I’ve collected over the years for an upgrade to glass. Giveaway ends 11 am CST on Wednesday, November 20th. For more chances to win check out the other Duralex Giveaways on Tasty Yummies, Hip Girls Guide to Homemaking, Food in Jars, and Local Kitchen! Whisk together the millet flour, potato starch, tapioca starch, gluten-free oat flour, xanthan gum, and salt. Cut in the butter. You’re done when there are still small visible flecks of butter, but you have an evenly incorporated mixture, ie: no big hunks of butter and no flour hanging out by itself. Add 2T of ice water and use a spatula to toss until combined. 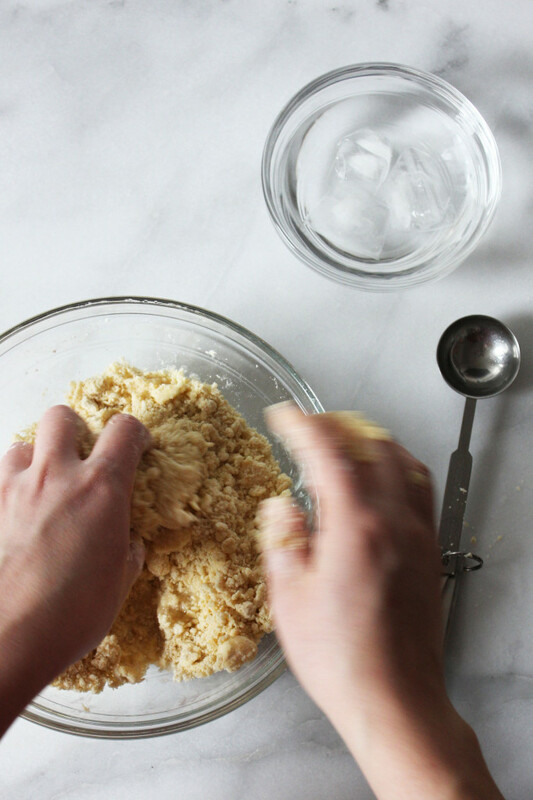 If needed, continue sprinkling in ice water, a little at a time as needed, just until the dough comes together. It should hold together in a ball, but not be too sticky. For me the sweet spot is usually somewhere between 2-3 T.
Shape the dough into a disc and refrigerate for 30 minutes. 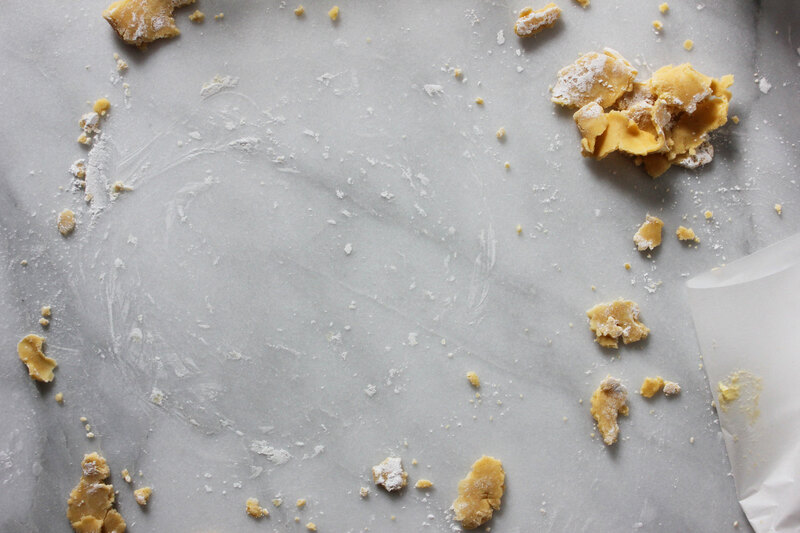 Remove the dough from the fridge and dust a large sheet of parchment paper with tapioca starch. Place the disc of dough on the parchment and dust the surface of the dough. Begin to slowly roll out the dough, dusting with tapioca starch as you go. You can also place another sheet of parchment paper on top of the dough, between it and your rolling pin, if you’re having trouble with it sticking. When the crust is between 1/4-1/8 inch thick, use the bottom layer of parchment to quickly flip the crust into the pie plate. Carefully peel away the parchment (if this is difficult, place the whole thing in the freezer for a minute or two and try again) and press down, trim, and crimp the crust. Place the crust in the fridge while the oven preheats and you whisk together the filling. 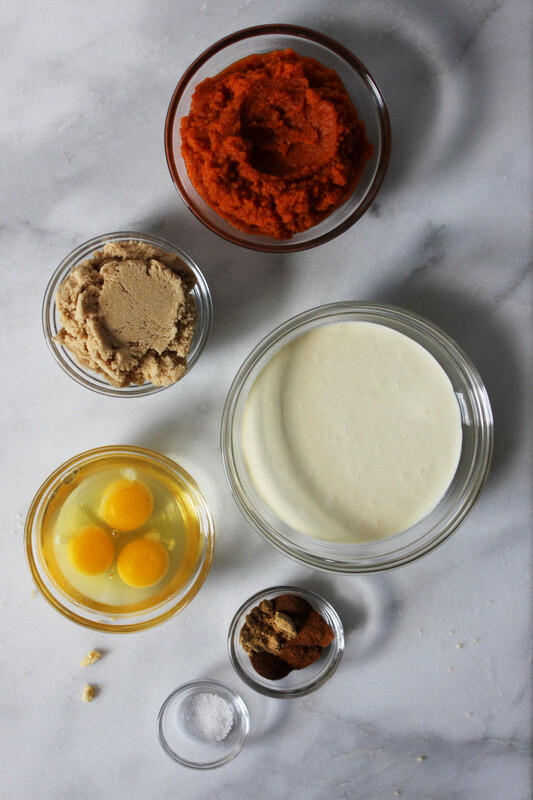 Whisk together the eggs, brown sugar, pumpkin puree, cinnamon, ginger, clove, nutmeg, and salt until it is smooth and thick. Gradually whisk in the heavy cream. When the oven has pre-heated, remove the crust from the fridge. Give the filling one last whisk then pour it into the crust. Bake the pie for 60-75 minutes, or until it only jiggles slightly and has puffed up. This recipe is adapted from the Old Fashioned Pumpkin Pie from Simply Recipes and this Maple Pumpkin Spice Pie from Simple Bites. 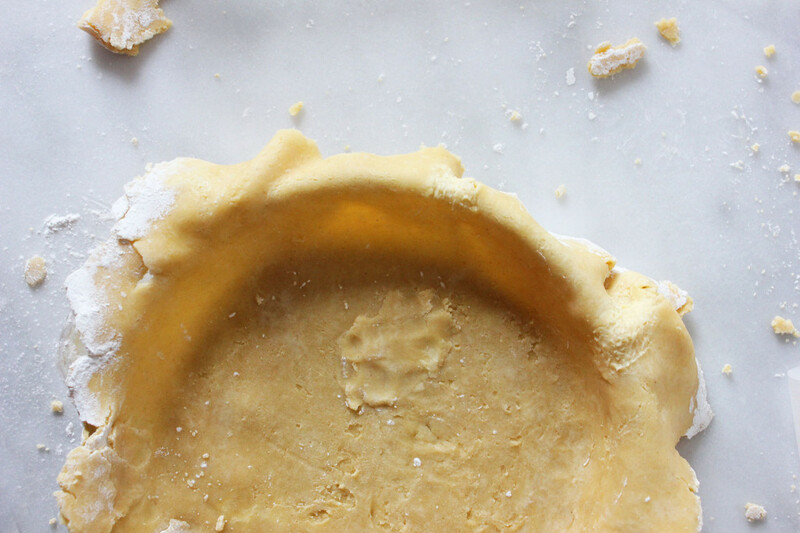 Although I’ve switched up my flour mix since then, this post on gluten-free pie crust has a lot of useful tips. It’s a complete no-no, but I’ve started working quickly with my hands to cut the butter into the flour. I use my hands until I’m happy with how it feels, then usually switch to a spatula when adding the water. Very liberating, but not at all recommended. Bring on the scorn. Disclosure: MightyNest provided me with a set of glasses and bowls mentioned above and will provide them to the giveaway winner as well. You know I want those Picardie tumblers: not sure why I’ve never picked them up over the years. And I have a smaller set of the stacking bowls – they’re brilliant. I want to replace all my plastic Tupperware. Thats the last thing in my house that’s plastic that still gets used! Trying to replace the plastic containers in my kitchen by the end of the year. I have started picking up some here and there when I have a little extra money in the budget. Thanks for a helpful giveaway! This looks like a wonderful recipe but there are no ingredients listed. I’m about ready to part with my Tupperware. A while ago I switched to compostable drinking straws but now I want a glass or stainless steel one. I’m trying to get rid of all my plastic tupperware and bowls and transition to all glass. I’m trying to start a refrigerator glass collection so I can ditch the tupperware. I really need more durable glasses. We have broken 4 this year alone. We keep finding plastic straws on super sale, but I am about ready for a glass one. That pie! Those glasses! Such beauty. I’m slowly replacing plastic food containers with Glasslock Snapware. I would like to ditch the plastic measuring cups for glass cups. I also have a lot of plastic storage containers that I would like to replace with glass. Plastic tupperware-style to-go containers are what I would love to replace with glass. I use them everyday to bring lunch to work and glass would be much better health-wise. Almost no plastic, next up: straws! Also hoping to figure out bread storage for the freezer that is manageable (currently, the fresh-baked-sliced loaf goes into a many-times-used ziploc. Otherwise, we’re glass! Freezer storage….glass that can stack easily is not as easily found! Getting rid of more plastic tupperware containers. I need to replace my tupperware with glass containers. I have a few, but not enough (yet!). I must win some of this glassware!!! That said, it was nice of you to leave us a recipe too! Love the gluten free pie recipe – I have a friend that can’t eat wheat so I am always looking for tasty alternatives! What a great give away to boot, I love the bowls. I mix pie crust with my hands too! Also, I’d love more glass storage containers. Yossy, that makes me feel a lot more legit! I would love to get rid of the old plastic bowls! That is a lovely pie. On a different note, I’d love to replace all the plastic in my kitchen. Ooh, how I’d love a set of those! (Thanks for the chance.) I use mason jars and vintage pyrex for storage and have eliminated almost all plastic from my kitchen except for popsicle molds (stainless ones are on my wish list). We need to get rid of all the plastic lunch containers! I still use the 3-cup plastic containers from the coop for freezing soup and storing leftovers in the fridge. Just haven’t gotten to the point of using jars effectively in the same way. My plastic food storage containers are next on the list. Tupperware! So ready for them to go! I would love to replace all my mismatched plastic food storage containers. I am beyond ready to give up all the cottage cheese containers. Too long have they held our leftovers. I want to get rid of all my plastic bowls. I’m eager to get rid of my plastic storage containers. I’ve been trying to use weck jars and ball jars for food storage instead. Will second/third/fourth/whatever the Tupperware suggestion. I always microwave my food in plastic for lunches, even though I know you’re not supposed to…but sticker shock always holds me back from buying the glass kind. One of these days! I would’ve to replace all of my plastic storage containers. It’s happening little by little luckily! I am working on getting rid of my plastic food storage containers. I have gotten rid of about half so far. I’m running out of plastic items in my kitchen, replaced with glass/wood/ceramic. I still find myself using plastic bags in the bulk section when I forget to bring some from home (no koot sacs! ), and I still wind up with plastic containers from yogurt/cottage cheese/sour cream. I’m trying to be better about buying my bulk items from stores that I can bring my jars to fill directly, and I’d like to make my own yogurt more consistently. I love these sets! I will be giving some gifts in jars this year for hopefully both TG and Christmas. Looking at Mighty Nest for gift ideas for me. All these glassware posts are convincing me to ditch the plastic — so thanks. And I’m jazzed for a GF piecrust — so thanks times 2! I want to get glass food containers to replace my plastic ones. I’m working towards replacing all my plastic Tupperware-type containers with glass. Plastic take-out containers and plastic freezer bags! I re-use the plastic I have for food storage that doesn’t involve heating (if the contents are to be reheated, I dump them into a glass bowl first), and as they wear out I’ve been replacing them with glass. I have a bunch of plastic tupperware and have been trying to slowly update my kitchen with healthier items. I’d love to have these glass bowls. I still have plastic kid cups that I’d like to replace. These tumblers look perfect! I have lots of small and medium sized containers, but I really need some larger ones. I still have a few plastic storage containers to replace. Plastic baggies and plastic canning funnels are the nest to go! I’ve replaced most of them to glass or stainless steel though I’ve few smaller size plastic snack and storage containers, measuring cups that need to be gone soon. I’d like to ditch my plastic storage containers next! I plan on getting rid of the small plastic snack container and replacing it with something sturdy for the kids. I really need to ditch my plastic storage containers. We’re slowly and steadily getting rid of most the plastic in our lives. … it’s a big job! These bowls are beautiful and would fit nicely in my kitchen! I have got to ditch my plastic ware for left overs…. I am trashing all my plastic food storage containers! We use glass not plastic. My metal mixing bowls are nice, but I’d love to have ones that I can put in the microwave to melt butter etc. plastic storage in pantry. I still have my flour, rapadura, and red lentils in the sistema pantry line. I have even created a photo stream on iCloud with pictures so I can replace those. in fact, I can probably still return them to the container store! I want to ditch the mish-mosh of plastic containers/tupperware I have. so glad to learn about these storage bowls. I would get rid of my rubbermaid bowls with lids. I thought I was down to no plastic (never had much to start with), but I have a plastic pitcher still in use. That really should go. Pie everyone can eat and sensible glassware every should use. I need to replace all the zip-lock bags I use – yikes! But I am trying to use glass more often for everything! I would like to get rid of my plastic storage containers. Plastic storage containers are on the list to go along with plastic mixing bowls. I’ve always wanted a set of these Duralex bowls. I want to replace my plastic storage containers! Almost 6 years after I started, almost all of our kitchen is transitioned away from plastic to glass! 🙂 A couple glasses, plates and bowls have broken lately so I really need to stock up. My plastic glasses are next on the list to replace; slowly weeding out the Tupperware, too! I could ditch plastic measuring cups and spoons. I would love to ditch all the kids’ plastic plates, bowls, sippy cups, etc. I need to ditch some plastic mixing bowls. I am SO ready to get rid of the plastic containers we store leftovers in! Replacing plastic food storage containers are next on my list! Only need to replace a few cooking utensils then I’m plastic free! I deperately need to replace some plastic food storage containers! What a beautiful pie!! I’m working on replacing my mixing bowls and measuring cups to glass. I would love to get rid of my plastic storage containers. I would like to replace my plastic sprainer with a glass or metal one. This recipe looks delicious! I will have to make this very . containers for leftovers are next, the hardest to pick up used! mismatched glasses are fine, they serve the purpose. Next on my list is my mixing bowls. Mixing bowls is next on my list I think, I have a metal big one and little one but i need a nice medium sized one! the kid plastic restaurant cups! I need these bowls!!! trying to get rid of all plastic in my home. this pie looks delicious!! Love mighty nest !! I’d like to replace my plastic spice jars next! I need to replace my large Tupperware-type containers. Hoping to find some good alternatives! What a great giveaway. Good luck to all. I need to get rid of my plastic measuring cups. I’d like to replace more of our plastic drinking glasses for glass ones. It’s a slow process because of cost. I need to replace my plastic blender next. These would be great to replace some of my plastic bowls. I Would Like To Try Glass Straws. I need to get rid of all my plastic lunch containers! I definitely need more glass bowls but I’m also hoping to get some stainless steel measuring cups and spoons. I’m dying to ditch all my plastic storage containers. We’ve been doing it piece by piece, little by little. I’d like to replace all my plastic sandwich containers! I need to get rid of old plastic cottage cheese containers that I store leftovers in! I’m always happy to find a new recipes to share with my many gluten free friends. I love duralex! I’d love to replace my plastic mixing and storage bowls. Thanks for the giveaway! We could really use those tumblers. Another chance to do away with more plastics. I want to get rid of the plastic that comes into contact with heat…like utensils. All those plastic disposable bowls that I reuse over and over! I’m sick of my plastic reusable containers for food storage. Food storage for the refrigerator. Luv the MightyNest products. Glad to have found your website as well! I’d like to replace plastic sippy cups. I’d like to ditch sandwich bags…I use ss containers in the kids lunches now but not for everything. Lots of horrible, mismatched plastic bowls and ziplock containers that need to go! I am in desperate need of new measuring cups. I want to ditch my lunch containers! The rest of the kiddos plastic cups! leftover containers. My mil keeps me stocked in the cheap plastic ones for free, so shelling out $$ for glass ones will be painful! My little guy has plastic cups, but I’m ready to switch him to some sturdy glass glasses soon. Measuring cups and spoons. I have a few glass ones but want to switch the rest of the way over from plastic to glass and metal. I’d like to cut out sandwich and freezer bags. I am trying to find the perfect replacement for ziplock freezer bags. We need some more picardie tubmlers! yum! would love to make it & use those nesting bowls! I really need to get rid of butter/yogurt/sour cream bowls and get glass! When my wife and I combined households this summer we were able to get rid of the plastic cups and dinnerware that her kids have used for years. Now we’re working on replacing our plastic food storage. I really want and need to get rid of our old plastic containers. I love the nesting bowls! I’ve been drooling over them since I discovered Duralex a few years ago. Hands down, their picardie tumblers are my favorite! I would like to ditch plastic water bottles for those fancy rubber-covered glass ones! I want to switch out all my plastic mixing bowls for glass bowls and my plastic storage containers for glass next. I have a gap for glasses and bowls. These items are very attractive– thanks for doing this giveaway. I’d love to have those lovely nesting mixing bowls! I want to dump a set of plastic mixing bowls and a few measuring cups/spoons. I need to upgrade my plastic food storage containers. I bring lunch to work every day, and often microwave my food in plastic, which is a habit I’d like to break. Been wanting to get rid of my plastic storage containers for some time now. Plastic lunch containers. Wonder if I could ever get the hubby on board with that. storage containers, mixing bowls, and serving utensils/spatulas!!! they’re all the most expensive and totally not in our budget right now! I need to ditch my plastic storage containers. I’ve replaced all our large storage containers for glass, but we simply don’t have enough smaller sized ones – especially lunch box small – in y home! Working on upgrading and switching it all out…slowly, but surely.. I am working on getting rid of the last of the plastic cups! I’m doing pretty well eliminating plastics, my over crowded fridge would agree with me! I buy butter in pound blocks, and have to find a better than plastic storage for the open block- I usually use plastic bags which annoy me. Mixing bowls. I’ve already replaced much of my Tupperware but still have some of that too. i love those cup glasses they look like a beauty and the fact that they are so safe and great for any spices that i have at home. Wow! That pie looks amazing! Millet is such a great flour! – healthy too. Yey, another gluten-free recipe to add to my list. Thanks for sharing.